lessening the burdens of government and acting in the public interest. Like IDAs, LDCs have a wide range of powers. They include the ability to construct and acquire development projects and the power to issue bonds without voter approval. Concerns about LDCs have grown over the past few years because local governments and IDAs have increasingly turned to LDCs to take debt off the books, provide questionable financing arrangements, and avoid statutory limitations (such as restrictions preventing IDAs from undertaking civic facilities projects). Another concern is the proliferation of LDCs with overlapping jurisdictions and similar purposes. As the ABO has explained, “this redundancy can be inefficient, promote unnecessary competition for projects and financing, and shift responsibility or control for public projects from government to not-for-profit corporations without proper public oversight.” There’s also some evidence that the Empire State Development Corporation has sought to use LDCs to avoid financial reviews by the Public Authorities Control Board. Classifying an LDC as a public authority ensures some amount of state oversight under the Public Authorities Accountability Act of 2005 and the Public Authorities Reform Act of 2009. The ABO has determined that 209 LDCs qualify as local public authorities, but keeping tabs their numbers is close to impossible given the ease with which they can be created. Tracking LDCs is even harder because the ABO doesn’t receive any notification when new LDCs are created. clarifying that local governments can’t guarantee or assume the debts of LDCs. The Comptroller’s report also identified substantial compliance problems with financial reporting requirements, noting that more than half of the state’s LDCs failed to submit reports to the ABO in 2009. Without this information, it’s difficult to get a clear picture of the impacts that LDCs have on public finances and economic development practices. 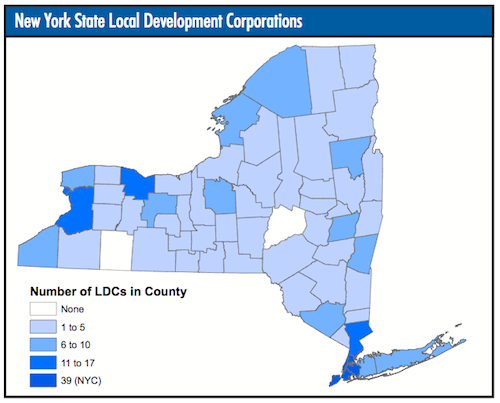 Additional information about LDCs can be found in the Comptroller’s 2011 annual performance report on IDAs and in the ABO’s 2011 annual report on public authorities.